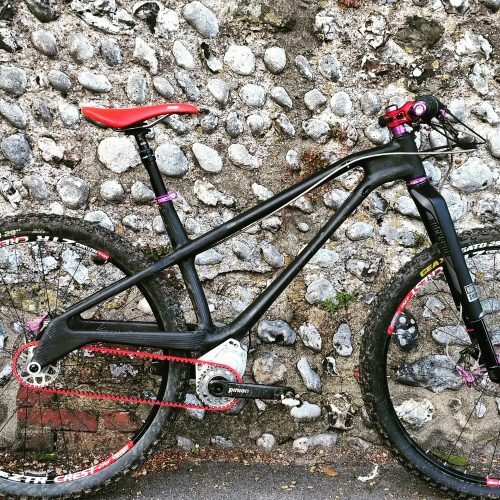 What would the perfect British mountain bike look like? 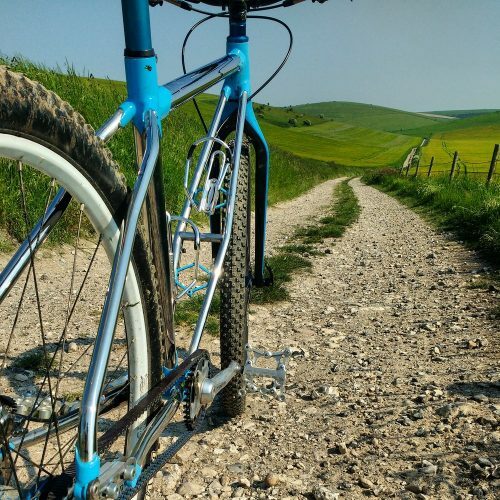 We each have our ideas, but during a one-day attempt of the South Downs Way, Steve Olsen decided that his ideal bikes would put all-weather capability first, taking advantage of Gates’ low-maintenance Carbon Drive belts, German-made gearboxes, and weather-resistant materials. 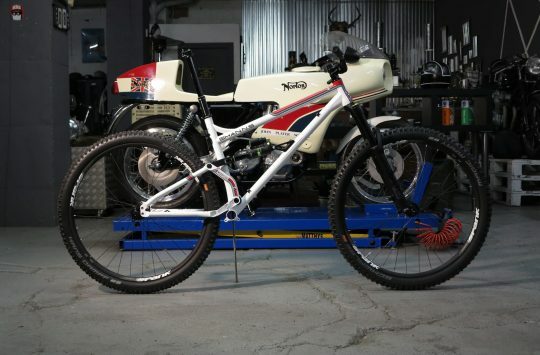 This thinking led to a pair of distinctive hardtail frames in carbon and stainless steel. First out of the pen is the singlespeed Lamb. 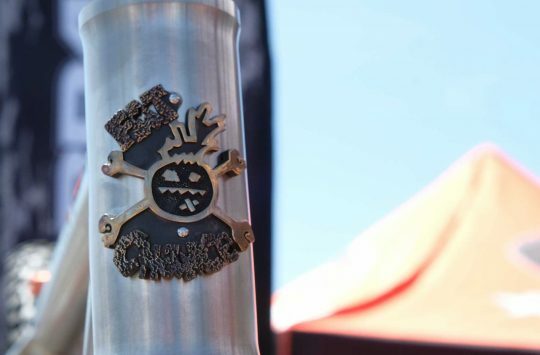 While the polished tubes would have been plenty to set the bike apart, Olsen have chosen a twin-tube “lattice” in place of a standard downtube, reducing lateral flex while maintaining vertical compliance. The polished main tubes intersect at laser cut, welded lugs- an arrangement that reduces the need to weld super-thin stainless and lends itself to custom geometry. The Lamb’s drive-side dropout can be separated from the stays to allow the installation of a continuous belt and geared dropouts are also available for versatility’s sake. 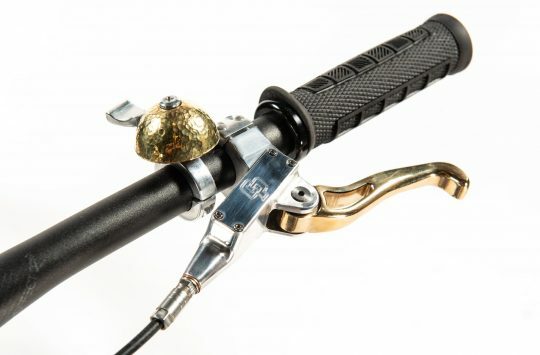 Routing is provided for a 31.6mm dropper post and the tapered head tube sports a handsome Olsen head badge. The Lamb is built to order and can be had for 26in, 27.5, or 29er wheels. Retail is £2,495. While the Lamb is awash in neo-retro details, the Swan & Ram are unapologetically modern hardtails built around a shared carbon fibre frame. 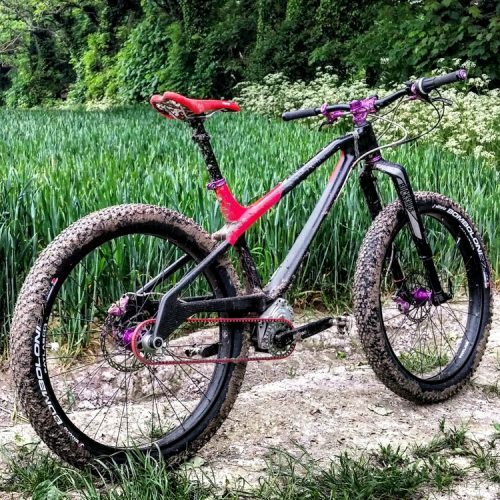 Built in the UK by “Formula 1 manufacturers,” the 29er Swan and 27+ Ram make use of Pinion’s enclosed gearboxes and Gates belts to soldier on through even the worst British weather. Also custom-built, the carbon twins can be tailored to the purchaser’s specification: top tube length and head angles can be adjusted and the frames built to suit 0-120mm of fork travel. The frames’ carbon layup can also be adjusted to suit the purchaser’s weight and riding style. Available as complete bikes, the Swan is built around 29×2.4in rubber while the Ram comes with 27.5×3.0 treads and in both cases 30.9in dropper posts can be accommodated. While the frames are built to order, prospective customers are encouraged to contact Olsen for a test ride prior to purchase. Framesets come with the Pinion P-Line gearbox, CNC Chainset and shifter. That Lamb would be lovely with a Rohloff if it can’t be had with a Pinion, would be very near my perfect bike these days. Looks like the Lamb has 135 QR dropouts, so its all go with Rohloff. “Vertical compliance” from this part of the frame involves spreading the wheelbase, surely? Which means allowing the top tube to shorten or the down tube to lengthen (or the fork to bend). Pull the ends of that arrangement away from each other and that brace prevents any elongation: there are no curves to straighten out. An alternative mental model makes the front triangle a four-sided polygon, reliant on stiffness of the junctions and the profile of its members to maintain stifness (or not). Well, even if you take each joint to be a free pivot, to change the relative positions of those four points you need to change the length of at least one of the main triangle tubes and/or the seatstays. Anyway, the claim is that it’s specifically the “down tube” structure that’s providing the compliance, which means it has to elongate. But the triangulated structure would appear to prevent that: any elongation would require the brace to compress, and it appears to be a rigid tube, not a spring. Sorry, you can scratch that first paragraph. It’s getting late and my brain hurts. OK Bez, The word “vertical” should be removed. Maybe compliance is the wrong word. I am no wordsmith. I will correct it on my website. The point I was trying to make is that the double down tube has a structural balance. It has to withstand fore and aft forces as well as lateral / side load under twisting. I made several prototypes to get this balance right. I originally had larger 19mm downtubes. This had no compliance and a very harsh ride. I then redesigned the elements and reduced the down tubes. The Lamb was designed to run rigid forks, so the frame needed to feel balanced between stiffness and comfort. Does compliance work to explain that? 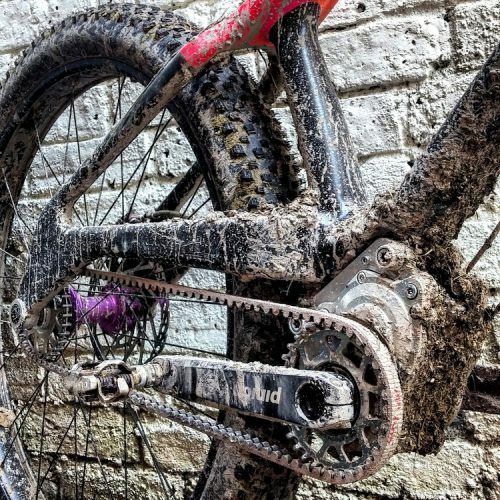 We’ve seen what happens to belt drive on MTBs in the UK – and it’s not pretty. Hi Scot, you can still run a chain and sprockets if you desire. However, I ran one belt for 3 winters and over 9000miles before it gave up. The main reason for early belt failure is incorrect tension. I have seen what happens to rear derailleurs in the UK winter and that is not pretty either. 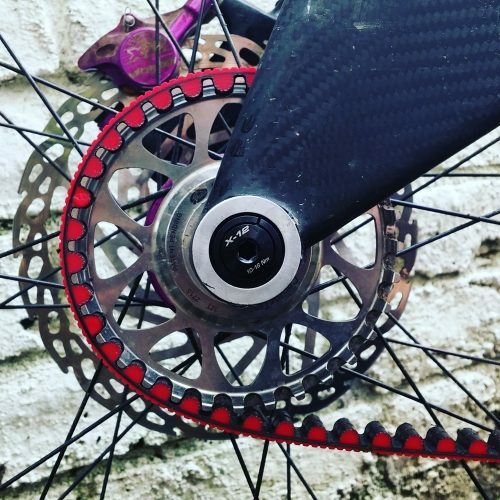 I am offering an alternative to the derailleur drivetrain and I think that Gates Carbondrive have an excellent product.